Product prices and availability are accurate as of 2019-04-18 03:26:29 UTC and are subject to change. Any price and availability information displayed on http://www.amazon.com/ at the time of purchase will apply to the purchase of this product. 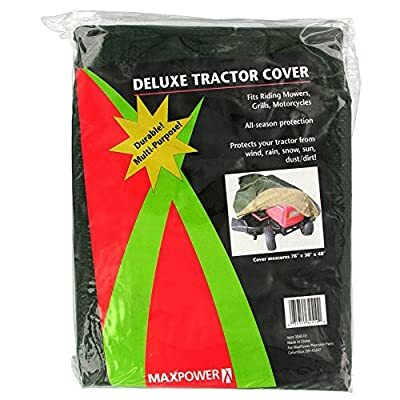 Keep your riding mower or tractor protected between uses with the Maxpower 334510 Deluxe Mower Cover. This durable cover is designed to keep the snow, rain, dirt, and wind from damaging your valuable yard equipment. Use it year-round to protect the finish of your item from the sun. Dimensions: 13.5W x 9D x 3H in.. Constructed of canvas. Green and tan finish. Durable all-season protection. Fits most equipment.